Windows 8.1 is here - so come on, Microsoft, when is RT getting a bullet? Happy Windows 8.1 day, everyone! If anyone's hosting a faintly creepy Windows party like the ones Microsoft promoted for Windows 7, do let us know. It's easy to mock some of Microsoft's lesser PR ideas, but Windows 8.1 itself is a solid update, albeit more akin to a service pack than a major upgrade: if you already like Windows 8 you'll like 8.1 a bit more, and if you hate it you'll hate 8.1 a bit less. It also means that at last, there's a Facebook app for Windows 8. The very fact that the Facebook app is newsworthy - because for an entire year, the world's biggest social network couldn't be bothered to make an app for the world's biggest operating system - sums up the dank cloud surrounding Windows these days. For many, Windows 8.1 isn't an exciting new update, but an Elastoplast. The Microsoft legend says that it takes three attempts to get things right. This week's Windows is Windows 8 version two. Who's wearing the red shirt? 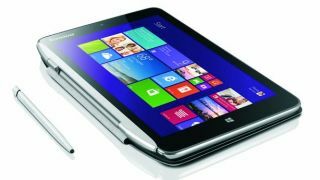 If we're reading Windows' tea leaves through the medium of product announcements, and we are, then here's another: Lenovo's Miix 2 brings Bay Trail, Office and Windows 8.1 together in a titchy tablet that'll sell for just $299. Microsoft legend says that it takes three attempts to get things right. This week's Windows is Windows 8 version two. Now what? What you're seeing isn't just a nifty little tablet. You're seeing yet another nail in the coffin of Windows RT. Here's another one. Windows Phone 8.1 will support devices with larger screens. Never mind the competition and their supersonic sales figures, Windows RT is being attacked on two fronts by its own siblings. Windows Phone is scaling up, and Windows 8.1 is turning up on some surprisingly affordable hardware. That means Microsoft is increasingly offering a choice of a mobile OS, a desktop/tablet OS and a half-arsed hybrid of the two. The "One Microsoft" currently has three Windows for two platforms: there's big-Windows on Intel, and there's phone-Windows and weird-Windows on ARM. If this were Star Trek, Windows RT would be the one wearing the red shirt. No matter how great Microsoft makes its Surfaces, RT is always going to be a poor relation. The OEMs just aren't interested, especially now that even Microsoft's former best friends see it as an "outright competitor". Windows RT was a gamble, and it didn't pay off - and the tea leaves suggest that this time next year, Microsoft will cut its losses.